We found the casual-cool Jessica Burns sipping a Chambord Kir Royale at Apres Diem in Midtown. What do you love most about what you’re wearing right now? My Charlotte Olympia sandals. They have the Eiffel Tower on them. I’ve never been to Paris, but I’ve always wanted to go. I had kids very early, so traveling hasn’t been my thing until now, since they’re older. Whenever I wear these sandals, it’s a reminder of that dream I’d like to fulfill. Are you an outfit planner, or do you dress by how you feel? I dress by how I feel every day. I might plan out certain outfits for events, but if I put it on and don’t feel great in it, I’ll always change into something that fits my mood. Where did you get the pieces you put together for today? My blazer is Rag & Bone, and the dress is James Perse. The summer fedora is from J. Crew, and my handbag is from the Tom Ford collection. My long necklace is by Charlotte Ronson. I’ve had it for about 10 years. Are you wearing anything that’s vintage or a family heirloom? My family gifted my other necklace to me for Mother’s Day. It’s a custom-made gold-and-diamond pendant that says #1 Mom. It’s very special to me. 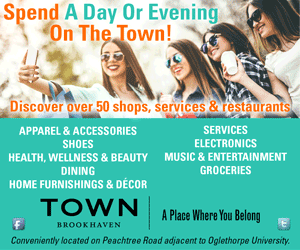 Where’s your favorite place to shop Intown? Bill Hallman [in Inman Park and Virginia- Highland]. I love the style and selection. [It has] been a go-to of mine for a long time. I like Ann Mashburn on the Westside for separates that travel well. Calypso St. Barth [in the Westside Provisions District] is great for summer beachwear. Where’s your favorite place to go for a great bargain? Labels [Resale] Boutique has great prices on some fabulous vintage designer pieces. I believe that I am a trendsetter because I don’t follow trends. If I like it, I wear it. I play by my own fashion rules. Although there’s one fashion trend that I have succumbed to: the choker. I recently purchased a thin gold choker chain by Crystal Streets Jewelry. I love Rihanna’s fearlessness in fashion and Rosie Huntington-Whiteley’s laid-back yet pulled-together everyday style. I have also followed the celebrity stylist June Ambrose for a while. I really love people who are authentic in how they dress. I don’t like contrived outfits. I like to see someone’s essence come through in his or her personal style. What are your favorite Intown stores to shop for vintage, shoes and accessories? Timeless Pieces Vintage. It’s an [online] Etsy boutique, but the owner, Sharetta Marcus, lives in Atlanta. I go to her house and pick out my favorite ensembles. She has everything: clothes, hats, shoes, accessories, even housewares. She has great prices, too. I found one of my most favorite New Year’s Eve dresses with her—super sparkly and fun! Where do you find fashion inspiration in Atlanta? Oh, everywhere! Just with everyday living I come across inspiring fashion that sparks ideas I can translate into my own personal style.